Music & Crypto - Alex Wang - MediumI can't believe it's only been 4 weeks since we all quit our jobs to pursue our cryptocurrency startup Ember Fund, it feels like it's been months. It's all been a blur, but in the best way possible. A bit of a cliche, but it really has been a rollercoaster ride. Would you recommend Jam Hunt to a friend? This is the integration that music & show lovers have been wanting forever, and it was made in two days! Amazing. 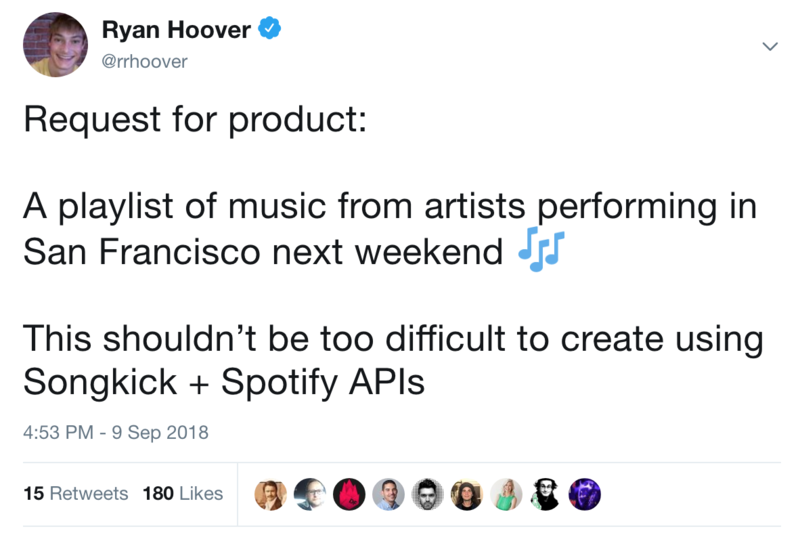 Features to add: Consider calling only top three songs per stream numbers, and allow it to display more than just weekend performers as that can be very limiting. Maybe a weekly playlist? Mandy Burgan has used this product for one day. Andy WangI was born at a young age. I wish they built other apps..
Ive been waiting for a product like this. Ultimately sometimes there are concerts near my house and I want to be able to sift through some of the songs before I go. It would be cool if they allowed you to go back to a specific concert and see what songs were played at the concert and save them to a spotify playlist. Andy Wang has used this product for one day. Guillaume TorcheMaker@guillaume_torche · Co-Founder @ Ember Fund. A crypto index. @guillaume_torche what a quick turnaround, nicely done! Would love to hear a little about the tech stack used for the site. @guillaume_torche @cedricamaya Hi Cedric, This is Mario, one of the other crazy makers :) Thanks! Glad you like it. We leverage a simple EC2 instance running a Flask (Python) web server :) Simple but effective. Marko Hlebar@markohlebar · iOS Developer, Drummer, Maker. What countries or cities does this work for?